It's Pep Rally week and we are here today to share a sampling of the NEW Paper Smooches April release with you! FOUR new stamps and EIGHT new dies will be available to purchase on March 31st at 8:00pm pacific time. Once our release goes live, you will find our new products HERE. Deadline: You have until midnight PT on Sunday, March 29th to leave a comment. Please check the Paper Smooches blog on Monday, March 31st to see if you are one of the FOUR lucky winners. Now it's time for you to hop on over to the next stop on the hop, the fantastic Jocelyn Olson! Terrific to announce an engagement! Very cute! This made me laugh! Very clever JJ! So creative and clever, love it!! Love love love this card. Can't wait to see the die! What a clever new die set and I love how you've used it for an engagement card!!! Awesome! OMG is right!! Love that "diamond ring", JJ!! FABULOUS! So gorgeous! LOVE the sparkly nails too! Oh, this is just fabulous, JJ! I love your design and how you added the rhinestone to the ring...so fun! This card could not be cuter. Love the fingernails. lol...LOVE the hand...love the circle and LOVE the sentiment!!! Cute idea and I love the rhinestone. What a cool card I can't wait to try this die set. Ok, that's so clever!!!! Love it as an engagement card!!! congratulations to your friend! Fun card for a very special time. Amazing! Love that hand with the fingernails... neat die set. Excellent idea for an engagement card! How fun is this? 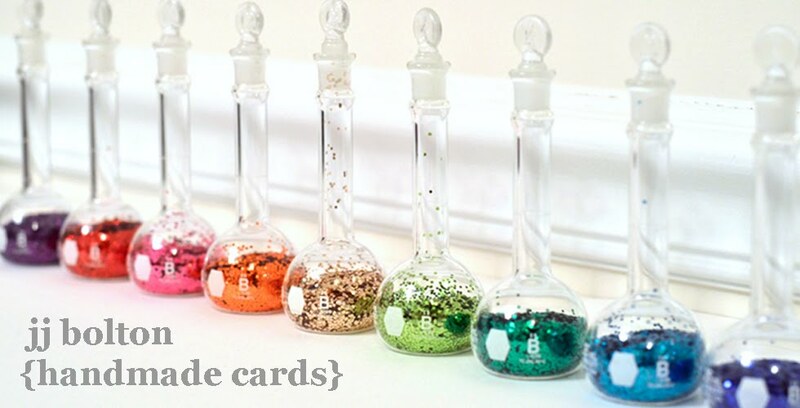 And yes--all my nail obsessed and recently engaged friends would LOVE this card! Super fun! I need that die set! Great way to announce an engagement!! The card is so cute. I am sure any newly engaged gal would love it! Such creativity! I love how your mind works, and I adore the bling. Please forgive me, but your card deserves a "totally cool" expression to describe it. It is fabulous. Cheers! OMG is right! How fun is this!?? I love the nail polish and that stunner of a ring! What an absolutely fabulous and original card! Love it!!! Your design is just genius - LOVE IT! Can't wait to see the new release! This is so fun and cool! Totally LOVE it! Love it! So simple, and makes a strong visual statement. Worthy of a twitter, facebook post and blog entry. SOOO FUN !!!! Love it !!! I love how unique this is!! Great!! Love this! So fun and unique! Really cute card I love the bling! what a fun way to announce your engagement! Forgot to mention.... I facebook'd about your blog hop! Thank you! Ha love it...what a great die and even better way to use it as an engagement card!!! Just posted on FB about the hop. LOVE this idea! So cute and unique! That die is soooooo cool! Could be used as a High Five too! OMG! What a great card! Soooooo clever!! Love this card. What a cute set! This is SO amazing!!! What a GREAT engagement card!! Love the bling you added to the ring!! Such fun! I love the idea of customizing the nails and ring. Wow! Shiny card! Can't wait to see this set in full! Great card for engagement card. How fun--I like the sparkle. I love this die set. Fabulous card! Fun card! Love that die set!!! This is such a fabulous image and especially love the 3D effect and diamond ring@!!!! You are so creativeness!! Love the bling - it finishes the card perfectly! So cute! I can see many ways to use this hand, like putting a paint brush in it, etc. Tfs! OMG... How perfect is your card! Love it! Makes me think of Single Ladies by Beyonce! Very interesting card for a special individual. I have never seen a die like it before. Your card is so stinkin cute! Darling card!! I love the polish! !I shared on Facebook!! You are right - these are totally different than any other dies out there. And, your card is super adorable and perfect for a newly engaged friend. Thanks for sharing! What a fun whimsical card! Great card - fun and whimsical! Love, love, love this die. It will be perfect for several of my girlfriends who are always get their nails painted! This is one of the most FUN cards ever! It celebrates love in such a creative way! Congrats, JJ, on a great card! Wow JJ, this card is awesome!!! What a fun engagement card! Thanks for sharing. Super, super fun! Loving this new release. Thanks for the chance and the inspiration! I love this! So pretty and unique! Oh this is so perfect for a wedding album I'm working on! I love it. A perfect to card announce an engagement. Really cute card. Thanks for sharing. What an adorable and perfect card for someone who has just gotten engaged! I love it! Such a fun engagement card. Love the red nails! So cute! Can't wait for Mar 31st! I love the background on the first card. The water and sky are shaded so well. My daughter has her nails done all of the time. guess I'll get that set for her. Wonderful card. Love your CAS approach. I have a daughter that recently became engaged, this is just perfect! OMG is right. So cooooool! What a fun way to congratulate someone on their engagement! Love it! This is an adorable card! I love the bling! What a fun way to announce an engagement! Wonderful card--I can't wait to see the whole die set! Such a fun card and such a clever design! 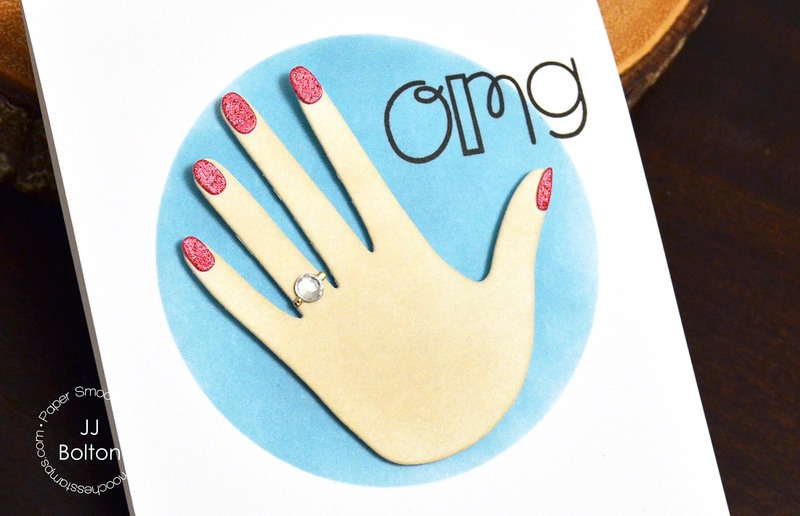 How fun is this card, JJ, and you executed perfectly…right down to the sparkly fingernails to match the shiny ring!